He is one of the most well-known jokesters in the world. Even 500 years after his death, his stories still amuse children as well as grown-ups. He puts his fellow human beings to test in an amusing manner while making social and political conditions of his time a subject of discussion – thus proving his intellectual superiority and astuteness. It is not surprising that even today he is still regarded as an undisputed master of tricks and jokes. While the question of his actual existence remains unanswered, the stories of his life published by Johannes Grüninger (“A diverting read of Dyl Ulenspiegel, born in the land of Brunswick, how he spent his life “) have been part of world literature for more than 500 years. The name Eulenspiegel is not without reason. 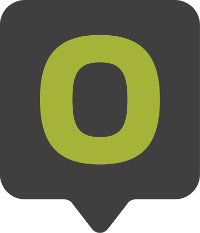 In ancient Greece the mirror was already regarded as a symbol of self-awareness; the owl as a bird of wisdom. Thus, Till Eulenspiegel virtually holds a mirror up to society while his pranks emphasize his mental dominance. 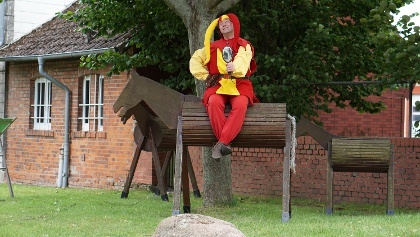 Visitors and locals get a chance to recreate the life and work as well as the many tricks of the prankster in the fool’s gown in Schöppenstedt, also known as the “city of pranks”. 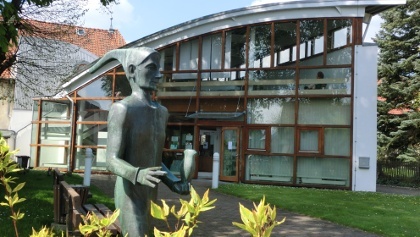 The Till-Eulenspiegel-Museum organizes events, presentations and concerts about the character. There even is a Eulenspiegel hiking trail that takes you from station to station to inform you about the medieval rogue. Cyclists take a literary journey on the 60 km route from Wolfsbüttel and Schöppenstedt while passing more than 30 fascinating Eulenspiegel stations. 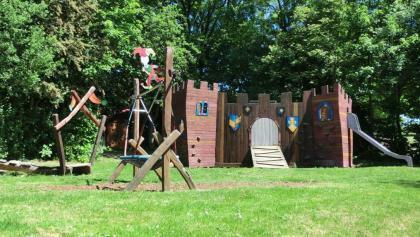 The Eulenspiegel adventure land is a special highlight for families with children. The thematic playground provides the opportunity to step into the world of the late jester from Lower Saxony who died in 1350. Here, one prank follows the next – entertaining both little and grown-up rascals. Ein Spielplatz für die Kleinen, der thematisch nach der Eulenspiegelgeschichte aufgebaut ist.